BANGI, 27 Mac. 2012- Six fourth formers from the PermataPintar programme have been offered places in various Universities in the United States after passing the American Standardised Test (SAT). The 16 year old students are Nur Syazana Natasha bt Hashim who have been offered a place in University of California, Davis; Yek Ching Kong and Khoo Jia Hui offered places in University of Wisconsin-Madison while Lee Yan Joe in University of California, San Diego. Vishal Kalyani Mukudan have been offered places in University of Michigan; University of Massachusetts, Amherst and University of California, Davis while Kavinraj Naggan A/L Sukumar have been offered places in University of Wisconsin, Madison; University of Purdue, Indiana and University of California, Sacramento. This was announced by Prime Minister, Dato’ Sri Mohd Najib Abdul Razak when launching the PermataPintar Negara Complex in the National University of Malaysia (UKM) campus here today. The Prime Minister said the establishment of PermataPintar as a school for gifted children, complements the National Education System and ensures that gifted children were not left out. Because gifted children could absorb knowledge and understand what they learnt faster, they could easily be bored if stuck in an ordinary school. Their needs have to be met so that they could realise their true potentials. PermataPintar is a commendable achievement, as it can mould a treasured generation with sharp minds, more creative in thinking and at the same time aware of the importance of spiritual and character development. 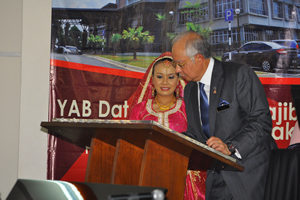 This was important in meeting global challenges, Dato’ Seri Najib said. 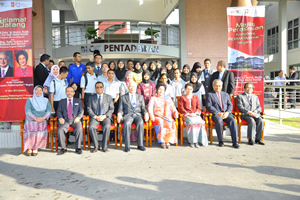 UKM Vice Chancellor, Prof Tan Sri Datuk Wira Dr Sharifah Hapsah Syed Hasan Shahabudin said PermataPintar students had gained international recognition. They have won gold, silver and bronze research awards in Korea, Taiwan, USA and the United Arab Emirates. Three summer camps had also been organised in collaboration with John Hopkins University where more than 1500 PermataPintar students identified through online tests had taken part. The Government of Saudi Arabia have also asked UKM to conduct an all girls summer camp this June, she said. A Memorandum of Understanding was signed between PermataPintar and the Al Bukhary Foundation which will finance the construction of an auditorium and sports complex for PermataPintar at the ceremony. Prof Sharifah Hapsah signed for PermataPintar and Vice President of Al Bukahry Foundation, Datuk Seri Ismail Yusof signed for the Al Bukhary Foundation. Present at the ceremony were Datin Seri Rosmah Mansor, the Patron of PermataNegara; Dato’ Seri Mohamed Khaled Nordin, the Minister of Higher Education and Prof Dr Noriah Ishak, PermataPintar Director.